Warner Bros Montreal has had the deck stacked against them from the beginning. 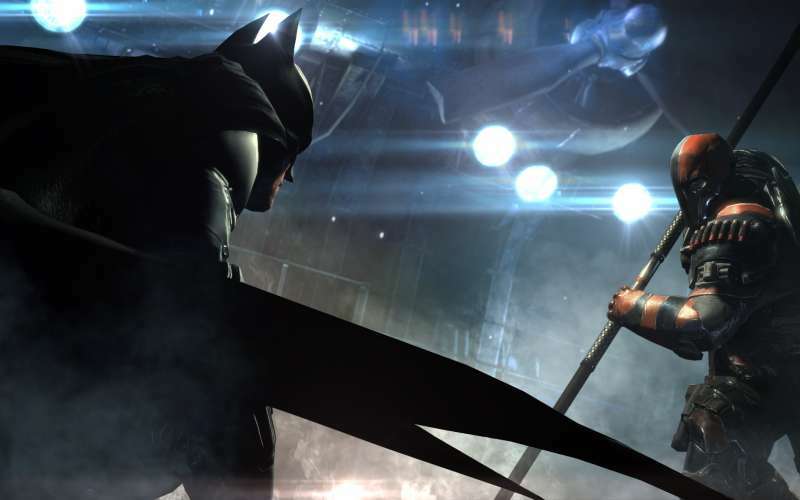 They’ve got the expectations of a fan base sitting on their shoulders, as they take on Rocksteady’s Batman: Arkham series with a prequel in the same story line. 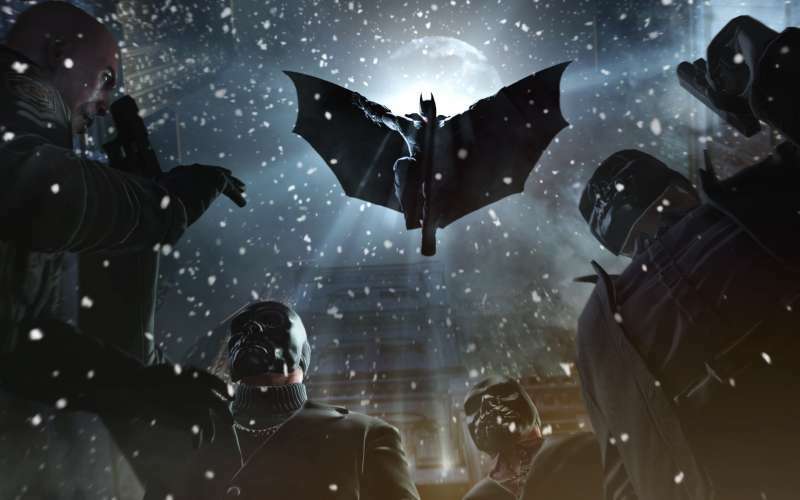 Batman: Arkham Origins is set a few years prior to the events of Arkham Asylum, you’re playing as a much more brash version of the Dark Knight. While he may be a short time into his crime fighting career, Batman is every bit as determined to deliver justice as you’d expect. The plot opens up quickly, with Black Mask putting a $50,000,000 bounty on Batman’s head, bringing in a stack of villains to do battle with including Bane, Deathstroke and Killer Croc. Other familiar characters make appearances, like Penguin, Enigma, Mad Hatter and the Joker. The obvious stretch here in terms of storyline is that Batman meets many of these villains in the same night – all villains who are prominent parts of the Caped Crusader’s lore. Batman is still considered a vigilante and the police force still has no love for him, including the SWAT teams and Captain Gordon. Oh, and its Christmas Eve, which Alfred tirelessly reminds you. Its curious that the city hasn’t ‘devolved’ in terms of technology, or Batman’s arsenal of goodies isn’t rolled backwards either. While the story takes place previous to the other games, I found it interesting that most of the technology used by Batman is the same, even across a few years. You’ll scan the same security boxes with the decryption tool, throw glue grenades into the water to built temporary rafts, as examples. Its curious that the city hasn’t ‘devolved’ in terms of technology, or Batman’s arsenal of goodies isn’t rolled backwards either. The world is mostly the same as Arkham City, which makes sense, just without the prison aspect. You’ll spend a lot of time zipping around from one end of the map to the other, though there is a quick-travel system put in place to help out. The controls are familiar, and combat works on the same Attack/Counter system as previous titles. There are some fun combos to find in the attack chaining, but I have had many fights where Batman simply won’t attack or flat out misses a floor takedown that shouldn’t – it can be frustrating at times. That being said, nothing can beat when you get on that 50x Attack combo streak. The training area in the Batcave was a big help in ramping up to building those bigger combos. The detective mode continues to be an interesting concept, doing crime scene investigations where you’ll scan in evidence to rebuild a sequence of events is intriguing, but rewinding through the sequence just to find the next piece of evidence is a little hokey. 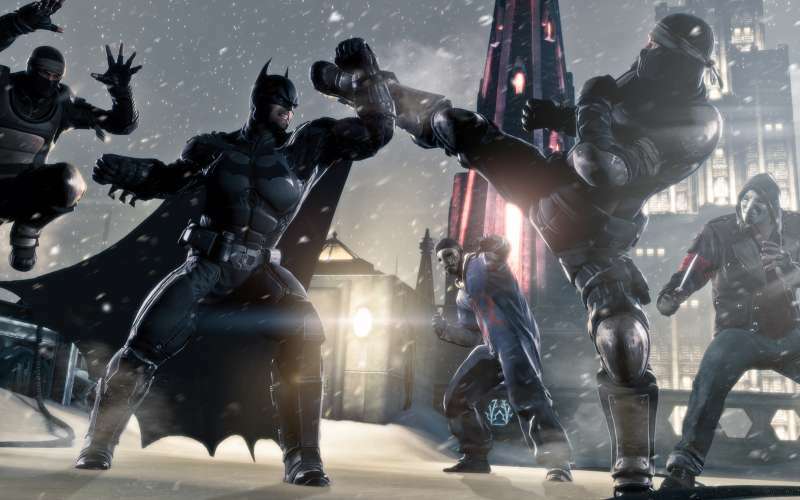 Batman: Arkham Origins stands up visually with Arkham City. As I played this on the PC, there are a few things I want to quickly mention as annoyances, but this may differ on consoles. When you use the quick travel, or enter/exit the Batcave via the Batwing, there is a single cutscene that plays – it is grainy, full of digital noise and just ugly. Compared to the in-engine content, it is truly rough looking. I had very few framerate issues, but nearing the end of the game, there were a few rooms that played like a slideshow on my system (and I’m knocking recommended specs out of the park) no matter how I configured the graphical settings. In the audio department, you’ll hear the standard collection of Batman tool eratta. The voice acting gets a big nod, with Roger Craig Smith taking over for Kevin Conroy, and Troy Baker (again with this guy) stepping it up playing Joker, as Mark Hamill has retired. I grew up hearing Hamill as Joker, and most other variations on the character are dull. Baker’s work is close to Hamill’s, but with its own flair. He’s done an excellent job. As a third person shooter, its clunky and the cover system isn’t nearly as fluid as it should be. There is a multiplayer component in here as well. 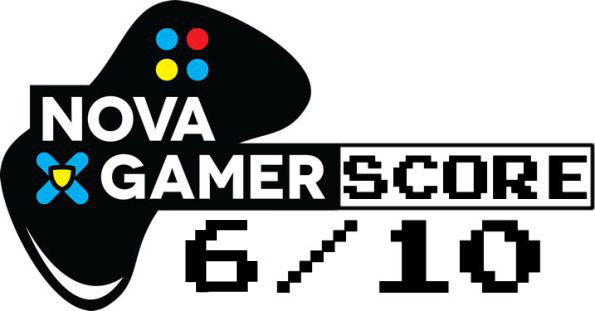 To best describe it, two teams of three will compete against each other in a race to capture control points and eradicate each other’s resources. 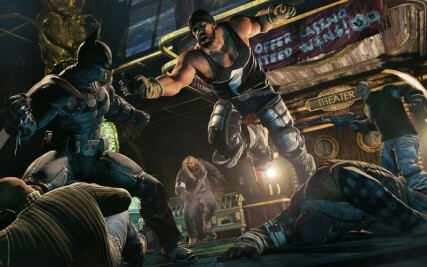 Two players are randomly selected at the end of each round to play as Batman or Robin, who compete against both teams for “intimidation points,” collected by KO’ing the thugs. The thug teams are playing as Joker or Bane gang members, and are equipped with grenades and machine guns. In the matches I played, gang members would be able to call in their leader (Joker/Bane) and take over as that character, who has their own special moves and abilities. There is a surprising amount of customization to the gang members, from the main screen of the multiplayer section, and you can choose from a variety of Batman & Robin skins to your liking. The hero gameplay in multiplayer is close to the singleplayer component, but the gang member gameplay feels rushed or incomplete. As a third person shooter, its clunky and the cover system isn’t nearly as fluid as it should be. It’s an interesting idea but comes off as more of just a mess in the long run. Overall, Batman: Arkham Origins fits the scenario most trilogies face: the second “thing” is the best. Arkham City still feels the most refined of the three experiences. That being said, if you enjoyed Asylum and City, Batman: Arkham Origins is simply more of what you saw in those two games. This is a good Batman game, but the issues with the combat and mash up of a multiplayer component don’t help the fact that the story never really seems to come to a peak, makes this title feel like a cash grab for those clamoring for a new and exciting Batman release. There is nothing in the package that is a must-see, and sadly, is what kills the Batman. Please Note: This review focuses on the PC version of Batman: Arkham Asylum that was available at launch. Issues described above may be patched in the future. Great review! I had a feeling this game was not going to be very innovative. It will be curious to see what they decide to do with the next installment or if there will even be another installment.